Part VI is still posted in the RyPN Articles Index. It seemed as if a great weight had been lifted. Here I was sitting at the edge of my field, on a warm, sunny fall afternoon, with nothing better to do than trim back the over ten years of growth, which had crept back while I had been hard at work rebuilding the ex-B&M coach #1246. I had now gone about as far as I could go. All in all it was both fun and worthwhile. Not a bad way to spend one&apos;s middle age. Exterior of B&M coach No. 1246 in 1992, before restoration. Early spring was not encouraging. I had varnished the interior the fall before, but in some areas a grayish blush was spreading over the surface, where there was none when I closed up in November. I tried to make sense out of the pattern, because some areas were entirely unaffected. I knew that I had pushed the envelope in two possible ways. First, I had done some varnishing when the weather was warm enough in the afternoon, but just barely and the nights were cool. Secondly, I had run out of the of varnish and the manufacturer&apos;s own recommended brand of thinner, and in the interest of getting the job done before winter, I substituted a generic thinner I assumed that like most manufacturers, they would recommend use of other products in their line, but that a competitor&apos;s would do as well. I overlooked, and disregarded, the fact that the manufacturer was a bit more emphatic on this point than most. "You must use our reducer with our varnish" The trouble was that I had trouble remembering just which areas I had varnished under which conditions. Oh well. Exterior of coach in 2001. There was nothing to do for it but to sand out the damaged work and start again. It wasn&apos;t easy since the hardness of the varnish wasn&apos;t affected and the affected area amounted to about a third of the entire area of the car. I just had to do it and this time I made sure that I varnished in mid-summer, with the proprietary product I am keeping a close watch on it now that the weather is turning cold and wet. I don&apos;t want to go there again. The other major project for the year was the finished floor. Pullman specs called for southern yellow pine 7/8" inch rift sawed and 3-1/4" wide, laid longitudinally with heading joints well staggered. This was to be painted with three coats of Agate floor finish. In an example of how times have changed over a century, it would be almost impossible to follow these directions literally. It is not at all hard to find southern yellow pine flooring. It isn&apos;t considered top of the line for hardwood and isn&apos;t nearly as expensive as some others, although it is far from cheap. It is normally made in 3-1/4" width. On the other hand, it is now a shade under 3/4" in thickness and more importantly, rift sawn is prohibitively priced. 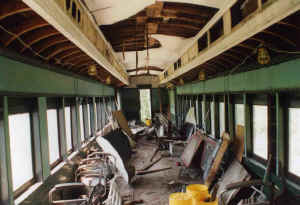 Interior of coach in 1992, before restoration. The old partially rotted floor, which I ripped up years ago, was in two layers, both 7/8" thick. 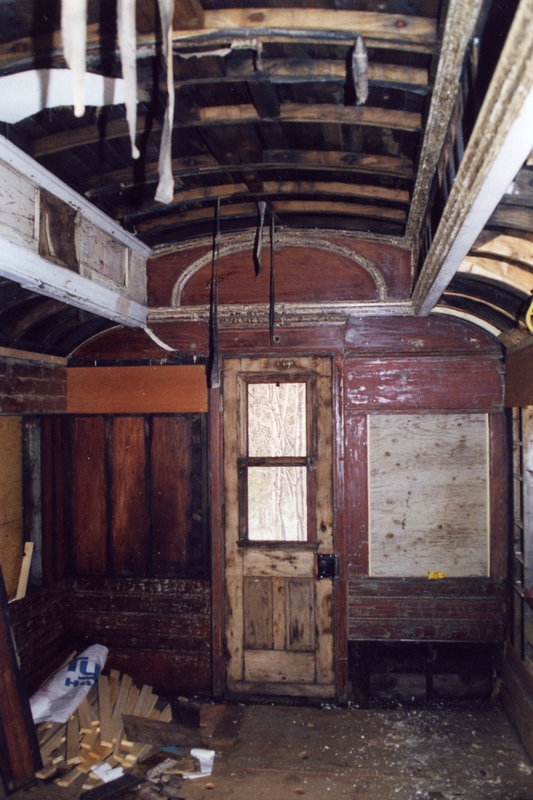 The lower was the original Pullman poplar boards laid across the car. 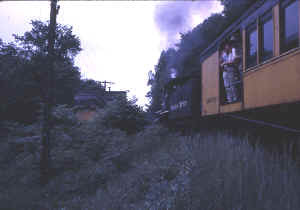 The upper was fir of the same type used in cabooses. When the car was converted, to MOW service in 1950, this new floor was part of the conversion. I replaced the lower layer with plywood, early on, which worked well. It wouldn&apos;t show when the finished floor was applied. Now, it was time for the finished product. The important change, over the original flooring, was the fact that rift, or quarter sawn lumber, is practically unavailable. When I priced southern yellow pine the first time a few years ago, I asked about quarter sawn and was told, I thought, that the premium I would pay for it was about 25% above the price of common. This spring, when I started pricing seriously, I found that the premium would be about five times the price of common, if it was even available. Rift, or quarter-sawn lumber, is lumber sawn so that the grain goes directly across the cross section of the piece. Lumber can be sawn so that every piece is quarter sawn, but the process calls for repositioning the log for every cut, and the amount of waste is substantial. Each log cut the common way has at least one board in the center of the log that is quarter sawn. The rest, working to the outside of the log, have the grain running at greater and greater angle away from the rift. So what? In 1907 there was plenty of old growth pine in the swamps of north Florida and plenty of cheap labor to harvest and saw it. Old growth had a tight grain because it grew slowly. Sawmills could afford the time and effort to make a superior product for a good customer like Pullman. When laying the new floor it was obvious how quality affected the overall job The stuff I was using was perfectly okay. It was clear and well milled, but a high number of pieces were twisted or warped. Not enough to be unusable, but requiring time and effort by me to wedge them into position, before I could nail each piece down. If the flooring had been rift sawn, it would have been easier and faster to lay, and incidentally, would have presented a more uniform grain pattern visually. Laying hardwood flooring doesn&apos;t call for a high level of skill, or experience, once you measure carefully and get the first course straight and even down one side. All you have to do is keep on and make sure you space the joints by at least two or three feet. I chose to work with 12 foot lengths, since that was about the longest I wanted to handle. Be sure to get the tongues and grooves on the right side before you carry each bundle into the car. You can&apos;t turn them in the car. Even though a professional would have used one of those hammer activated floor nailers, I chose not to. I would have had to rent one every time I wanted to work, which would have been needlessly time consuming and expensive Another reason was that I didn&apos;t want to work for a long time at a stretch. Flooring involves a lot of getting up and fetching, trying, sawing, wedging and nailing. That tires me out after an hour or so. Under those conditions, I did better with a hammer and nail set. That, coupled with my buying a smaller amount of flooring at a time, as I had the money, accounted for most of the summer, before the job was done. I came out nicely, but I still have to sand and polyurethane. I&apos;m not even going to try to find Agate floor paint, whatever that is. Oil based polyurethane will have to do. The builder&apos;s photos show an unstained natural colored floor and that is the effect I will get. At the start of the project the area where the men's saloon is now looked like this. Note the wasp nests behind the removed paneling near the upper left side of the door. With those two big areas taken care of, the work begun years ago was about complete, at least as much as I could do. The biggest lack is seats. I have no reasonable chance to pick up enough Hale and Kilburn #77 seats to make worrying about it worthwhile, especially since the next owner may not have any interest in them. I have always thought that the future for this car might well be as open space, not as a passenger carrier. There are a few areas that need a spot of varnish or a bit of work and more will turn up over time, but mainly I am done. After stripping the paint at the men's saloon area. Here are some random thoughts that have come to mind in the 13 years I have been at work. How and why could a single person do, or even want to do this? If you&apos;re even reading this, you know how a person could want to do this It&apos;s both fun and worthwhile, but actually taking the plunge is something else. Where do I find the time, the money and the space? The time is an important consideration. I was told at the outset, by someone who didn&apos;t know me very well, that I had better have a strong marriage if it were to outlast the expenditure of time and energy this project would demand. Well, I am still married to the same woman and the other fellow is dead. It can be done. Think how much time you spend on your hobby now, probably quite a bit if you&apos;re middle aged, with your child rearing duties behind you. A subsidiary question is whether you should work alone or as a group. I did it alone. Mainly because no one else expressed any more than a polite interest. I am not sure I would have welcomed a group effort anyway since the problems of managing would outweigh the benefits. I suppose it&apos;s a matter of personal preference At least there&apos;s no one else to blame and no one to blame you. If you want to do it, you&apos;ll find the time. As far as money goes, I have records of my expenses, but I have never totaled them. Spread over the years, they aren&apos;t excessive. A little here, a little there, interspersed with some bigger hits on rare occasions is nothing to flinch at. How much do most people spend on toys and hobbies over the years? The biggest problem is space. In fact, it might be the deal breaker for some people. A lot of projects go forward, but unless you own, or have a firm hand over the space you occupy, trouble awaits. When I started this work, I considered placing the car on a siding about 45 miles from my home I would have had to pay rent of $100/month and for this I would have gotten electricity and insurance coverage. My cost for this would far exceed the cost of moving the car and I would have had no assurance that I wouldn&apos;t be evicted later on, when such a move might be convenient for the owners. Thank goodness the owners took a look at the coach before I got it and decided to turn me down as a tenant. After another abortive attempt to find a space, I took a neighbor&apos;s advice and moved it to my house. Granted, I have more space to do this than most people living in a suburban neighborhood, but not a lot more and you don&apos;t need a lot more. I had to obey setbacks from lot lines in locating the track and did so, but in no other way did I run afoul of the authorities or the neighbors. It can be done. I can think of at least five other examples where people have done the same thing with similar cars just in northern New England. What decisions did you make and why did you make them? Just how pure is pure anyway? In figuring these out, you have to remember that a wooden coach today has two possible futures. One is as a working passenger car on a tourist/ scenic line or as a static display. In the former case, an operator has no business running a car carrying passengers unless the car is totally rebuilt, with as much an eye to human protection as to a long and trouble-free operation. That means, in essence, jacking up part of the roof and building a new car under it. Not a problem if that&apos;s what you want to do. The other option calls for a car that will stand up under the most adverse of conditions- non use. A car that isn&apos;t in motion doesn&apos;t dry out after a heavy rain. There is one wet side, constantly in the shade and the other is baking in the sun. The life span of such a car is meant to be indefinite, not the twenty years or so expected when the car came out of the builder&apos;s shop. These factors are coupled with the fact that unless the original fabric is retained, or closely replicated, the car has little historical interest. My only real option was to follow the second path, since I didn&apos;t have a railroad to run it on and wasn&apos;t likely to get one. When I first got the car, I didn&apos;t have much of an idea what to do with it, except repair it. I accepted the fact that it was a combine and that I would put it back that way. It didn&apos;t take long to figure out that it wasn&apos;t a combine and that there would be a lot more work ahead, than I had planned on. Most of the wooden parts were somewhat identifiable as to species. I knew that the match stick siding was poplar and the rafters across the top of the car were white oak. The rest was a mystery to me. When I first began to replicate parts of the frame, I did some limited work in spruce, works for houses. Not a bad choice necessarily, but not historically correct nor the best for operating conditions. Once I obtained the Pullman specs, I could tell what the original materials were, but they were not necessarily the best for a lifetime of static display. Modern materials probably will outperform yellow poplar on the outside. Plywood, in places hidden from view will outperform the original under Flooring. Stainless or brass screws are a much better way to fasten two pieces of wood together better than nailing, even though iron nailing, as done by Pullman, may have been more efficient from the standpoint of first cost. Long story short, I chose what I thought was the better material and method over the original. My goals were not those of the maker after all. I can understand the efforts made to replicate using original materials and techniques. These are purest of the pure. little like the replicas sold in museum gift shops, they may be very good, but no one is going to value them like an original. Under the circumstances, I think I have made a fair compromise. Anyone can get the full spirit of the original, that was possible financially and physically for one person to do and it is likely to last under expected conditions. What&apos;s going to happen next, you ask? The answer is mainly up to you in the preservation community. 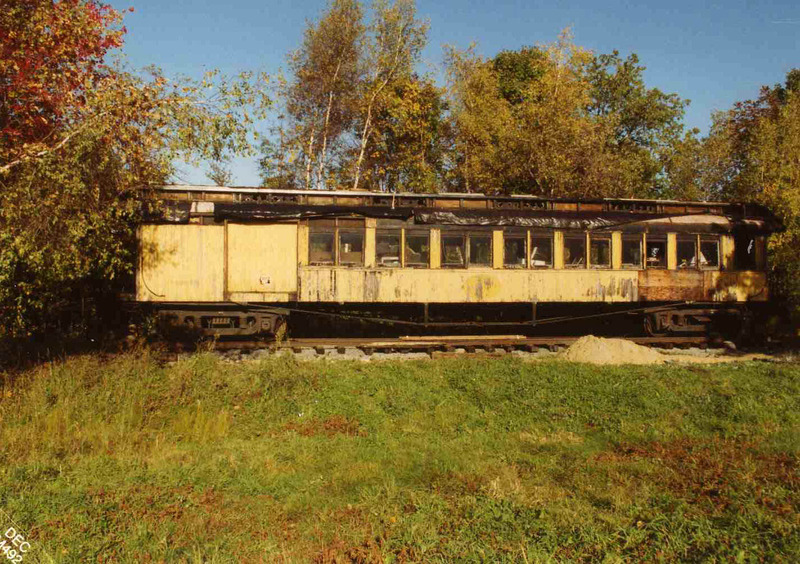 When I started this project, I didn&apos;t do it because I wanted to own a passenger coach, but because I didn&apos;t want a beautiful piece of American history to rot, collapse and be scrapped as was at least one of her Riverside companions. I thought I could do something to prevent that from happening and I did. Now it&apos;s your turn. Who will take on what will now be only a modest responsibility? B&M coach car behind former Rahway Valley 2-8-0 steam locomotive No. 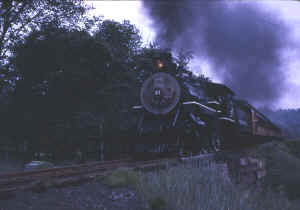 15 at Steamtown in 1967, and now on display in Scranton. At that time the car was numbered MS&N No. 243. Ideally it will be an organization with enough potential for continuity to assure at least a reasonable life span for the work already performed. Wooden coaches, no matter how well preserved initially, left neglected, will go down hill with amazing speed, even though the damage may not appear on the surface until much later. Yearly maintenance is a fact of life and an organization that doesn&apos;t realize this is delusional. Therefore, whoever picks up the coach cannot fool themselves in this regard. Why would somebody want a wooden coach? That&apos;s a fair question. Someone might want to use it to interpret the industrial history of this nation. This car has a lot to offer. It was constructed only a few years after the famous Pullman strike of the 1890s where employees fought for the respect of management How successful, or not they may have been, is reflected in the amount of hand labor still found in the car, particularly in the interior trim and appointment. The suggestion is clear that skilled hand labor, even in 1907, was not well paid If it was, no railroad would have paid the price for the finished product Remember that this was several years before Henry Ford upset the U.S manufacturing world by paying a minimum of $5 per day to his workers. The steel coach, with much less ornamentation, came into universal acceptance at about the same time. Not only was the car the last of the wooden coaches turned out by Pullman, it was one of the last open platform wooden coaches as well. 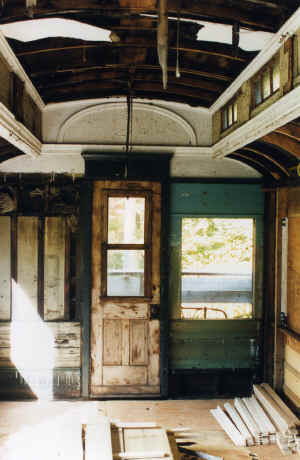 The enclosed vestibule car was well established by the time this one came on line, but probably for reasons of economy, the Boston and Maine ignored the increased safety and comfort of that improvement and insisted on the open platform wooden coach, until the absolute last gasp of wood, in 1911 or 1912. For some reason, the B&M had a few enclosed vestibule wooden coaches, but those were an exception overall. This car was the 23rd of a 30 car order turned out by Pullman in July 1907. By the time the B&M ordered any more, Pullman must have declined in favor of all steel production and the railroad had to turn to Laconia and Wason for the balance of their wooden car orders for the next few years. Another fact of history is the length of life these coaches enjoyed. Railroads all over the U.S. had fleets of wooden coaches until World War I when steel coach use became universal. Most railroads eliminated their wooden fleets shortly thereafter, but the Boston and Maine kept theirs in commuter service out of Boston&apos;s North Station and on some minor passenger and mixed services in rural areas. This operation lasted a good thirty years, being phased out only at the end of 1953. This was reportedly an agreement between the Railroad and regulators. The B&M could abandon some services if they would introduce steel commuter coaches in place of the unpopular splinter fleet. History aside, the wooden coach is very pleasing esthetically. A twentieth century author, James Jones I think, made the point that Americans had produced three items of intrinsic beauty, the ax, the clipper ship and the 1903 Springfield rifle. He should have added the wooden railroad coach. The graceful lines of the hood, the clerestory and the match stick siding create a harmonious design and feeling of casual elegance not found coaches since. Another shot at Steamtown in 1967. The old coach must earn her keep. As an interpretive space or sales area or even office use, there is a lot of life left in this old relic. It is not an opportunity to be passed up in favor of a lesser space. These are some of the reasons you ought to be interested in this piece of equipment. If you have a good idea, get in touch with me.